The 55 Rhyme & Theme cards are placed in a pile, face down, at the center of the table, near the card tower. Each player gets a sheet from the notepad and a pencil. On the left side of the sheet, the player will be able to compose his/her love poems. The right side of the sheet represents the tower at the bottom of which the would-be lover stands. 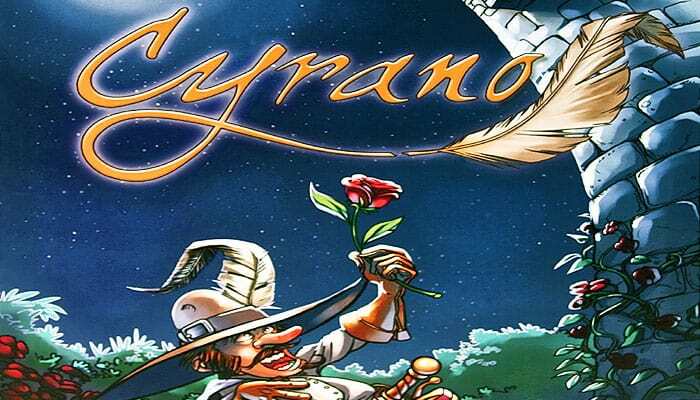 Just like Cyrano, you are helping a man who is hopelessly in love, who, at the foot of the tower where the object of his affection resides, must recite poetry to be given the right to join her on the balcony. The more original the poem, the faster he'll climb. Moreover, if you show good taste in poetry, the woman of his dreams will be seduced and she will come down the stairs to meet her Romeo faster. The first player to make the lovers meet wins. Advice: Don't worry, you really don't need to be talented with poetry to play and win. A bit of bluff and fi nesse will be the best way for you to win. The game takes place over several rounds. In each round, the players will compose a quatrain (a poem with four lines). Depending on its originality and beauty, the players will be able to mark squares in their tower and thus allow the lovers to draw nearer to one another. Phase 1 : Writing the poems. 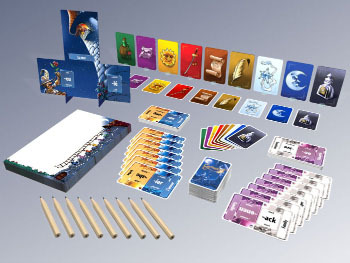 The first player (determined however the players want for the first round) flips over the first card in the draw pile, inserts it in the card tower (from top to bottom) and announces the theme. The first player then flips over the two following cards, inserts them in the tower (2 & 3) and announces the two rhymes which must be used during the current round. The players can now start to write their poems while following the required theme and two rhymes. Two of the lines must end with one of the rhymes chosen and the other two with the other rhyme. The important thing when choosing words is to respect the phonetics (the way the rhyme sounds), as the spelling can be different. Example: for the aid rhyme, words «lemonade» and «maid» are correct. There are no other constraints (the placement of the rhymes as well as the number of syllables in the lines do not matter). It is both useful and a good idea to title your poem. The example words on the cards can be used by players when they can't find words that rhyme, but these won't be worth any points. For later games, you can agree that when there are only 2 players left writing their poems, they only get one minute to finish. In turn, starting with the first player, everyone recites their poem, title first. What really matters for this game phase is the last word of each line. Once the poem is finished the player will have to re-read the four words which end his/her lines. The other players must then tell him/her if they've used identical words to finish their lines. For each word that he/she is the only player to have used (the example words don't count), the player can mark one new square on the ladder on his sheet, starting from the bottom. Example : If the 4 words at the end of my lines are «Leave», «Cleave», «Beauty» and «Majesty» and only «Majesty» hasn't been used by another player, I'll only be able to mark one square on my ladder… that ought to teach me to be original! Once all the players have recited their poems and possibly marked their squares, the game moves on to the next phase. When a player marks a ladder square with a ribbon, it means that the player has reached the floor with the corresponding color. If a player has not been able to finish his/her four lines, that player can still mark squares for any original rhymes found. If a player has made a mistake (a «-ime» rhyme instead of «-ine», for example), then the player does not score for the word, but will be able to score points for any other unique correct rhymes. Before voting, the first player reminds everyone of each poem's title in order to refresh everyone's memory. Then, each player secretly chooses the poem he/she has most appreciated. To do this, the player chooses the card with the symbol of his/her favorite poet for this round. It's okay to vote for yourself! Advice: Start to sort your cards by discreetly putting aside those corresponding to poems you've liked while they are being read. It'll be easier for you to vote once all the poems have been read. With this vote, the players will be able to make the woman of angelic beauty come down from her tower. As soon as everyone has chosen, the players simultaneously reveal the card they've chosen. Each player can mark one square on his/her tower for every player whose vote matches his/hers! The trick here is to show some good taste by guessing which player will get the most votes. These squares are marked in order from the top of the tower going downwards with each passing turn. Example: I vote for Angelo as his poem seems the best. The votes are revealed and three other players have made the same choice. I can therefore mark 3 squares on my tower and make the woman come down 3 squares because I have good taste in poetry!